The United Nations needs to spend more time talking directly to young people across the world, beyond simply talking about their concerns, said the President of the General Assembly on Wednesday, opening a major Youth Dialogue event at UN Headquarters in New York. Quite often, he said, “they have a feeling that when they speak, no one is listening”. He added that the themes he was keen to hear their views on were education, jobs, and the complex issue of how young people could be dissuaded from taking a path towards violent extremism. “We talk about it, but we still don’t really get it – don’t really grasp it,” he said. Other speakers included an athelete from the Pacific island nation of Tonga, who won world reknown, when he marched shirtless into the opening ceremony of the Rio Olympic Games in 2016, carrying his country’s flag. 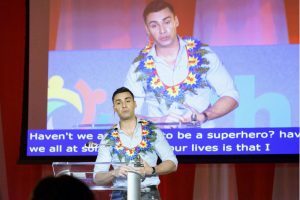 “The world does not need violence, does not need bombs, the world needs today’s youth to become superheroes,” said Pita Taufatofua. At the UN, wearing a shirt, he said his brother advised him to “keep your shirt on and leave the oil at home”. The second piece of advice from his brother was, “tell your truth, leave the youth with something they can take into the future,” Mr. Taufatofua said.